Looking for do it yourself patio cover ideas? You come to the right place. You’ll find ideas for wood patio cover design and metal patio roof cover here. Knowledge of how to build your own patio cover put you in a much better position than a person who doesn't. 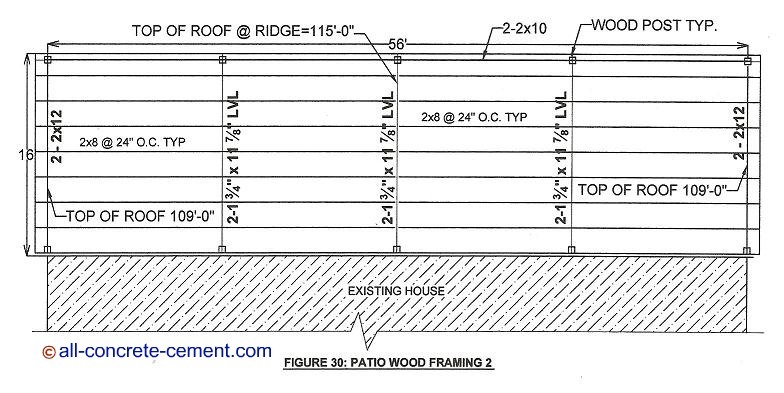 Figure 30 below is an alternate to the patio wood framing in figure 28. As shown both designs use 2x8 roof rafters but the material required for figure 30 is about 50 percent more compared to figure 28. This increase in material is due to the arrangement of the framing. Not only more beams are required but more columns, more footings, more concrete piers which will definitely lead to more labor cost. In figure 30 the top of high point at roof ridge is 115'-0" sloped down to a low 109'-0", roughly 2.5:12 slope. The height of the roof can be raised or dropped depending on the owner's need. If you prefer steel patio covers, click here where the exact same structure is framed with structural steel c channels with(HSS) high strength sections as columns. In this application metal deck is used for roof. figure 28 make the studs at the existing house less likely to be able to support column loads. These loads are about 4,000 pounds a piece which will require a column, concrete pier, and concrete footing adjacent to the existing house. The 24 inches spacing of the new 2x8 rafters in figure 28 spread the load out making it more manageable to be supported by the existing studs. Missing from figure 30 is the 7/16 inch wafer board sheathing over the 2x8s. Either wafer board or 1/2" plywood sheathing will be sufficient to support the roofing. The wood patio cover design shown in figure 30 is a good example of diy patio cover design. Whether you build it yourself or hire a contractor these patio cover roof plans will help guide you in making informed decision about your project. Should you have further questions do not hesitate drop me a note in the "ask a question" section and I'll happy to help in anyway possible.